The hiop MT-Series Electronic Control Unit (ECU) is a microprocessor-based computer, which the user can program to meet the specific running demands of an engine. The hiop ECU uses data collected from the engine RPM, manifold pressure, Air Temperature, Throttle position, Water Temperature and battery voltage to make instantaneous decisions as to the engine requirements of the engine to maintain optimum performance under all conditions. It also comes with all required software to control ignition timing. The adjustments available include RPM, manifold pressure, boost retard, air/water correction. While the software is included with the basic unit, different signal converters and ignition drivers to fire either a multi-coil pack or single coil are required for individual application. To assist with fine tuning, the MT series stores the information which relates to RPM, Manifold pressure, Air and water temperature , Throttle position, Injector switched on time (mS) , Primary and Secondary voltage, Air/Fuel ratio and Ignition timing. Your ECU comes fitted with a computer chip which is factory set with a basic program to suit your engine. This should enable you to start the engine as soon as you plug the ECU in. However this is only a basic program and as every engine is different, fine-tuning will be necessary to achieve best results. 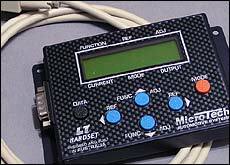 Also available is the LT-Series software which enables you to tune the ECU using a laptop ; alternatively our handset may be used.